General Boonsang Niampradit, a member of the National Legislative Assembly, arrives at the Parliament in Bangkok before the NLA's opening Friday. Thailand started back on the path to civilian rule Friday when the National Legislative Assembly (NLA) convened. The NLA met Thursday to receive blessings from the Crown Prince and the Monarchy but they conducted their first business Friday. 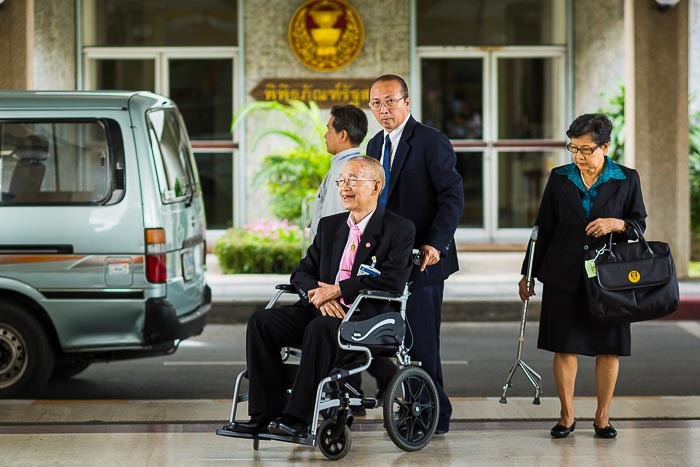 Somporn Thepsittha, 89, the oldest member of the National Legislative Assembly, arrives at the Parliament Building. Somporn chaired the first meeting of the NLA. The NLA has a strong military flavor. There are 197 members. From the Royal Thai Army 40 members are Generals, 21 are Lt. Generals and 7 are Major Generals. From the Royal Thai Air Force 17 are Air Chief Marshals and 2 are Air Marshals. From the Royal Thai Navy, 14 are Admirals and 5 are Vice Admirals. There are also 6 Police Generals and 3 Police Lt. Generals. There are 187 men in the NLA and only 10 women. It's expected that the body's political reforms will attempt to severely limit the role of the Shinawatra family in Thai politics. 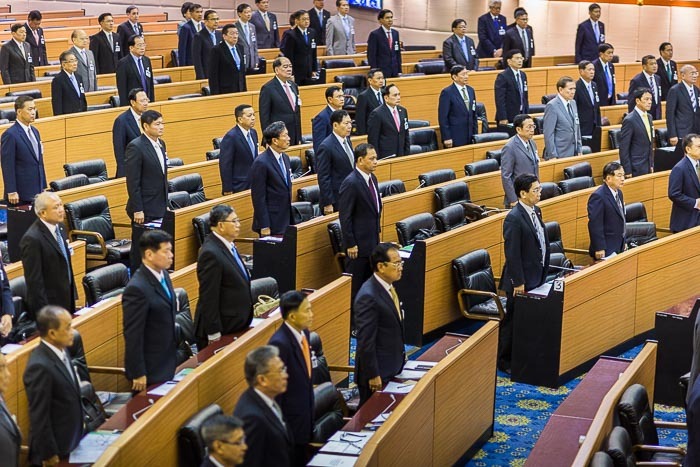 NLA members stand during the opening ceremony - not many women in this picture. Only about 5% of the body's members are women. The first thing members did was elect their leadership. Happily, the results were unanimous. Pornphet Vichitcholchai was elected President of the body. 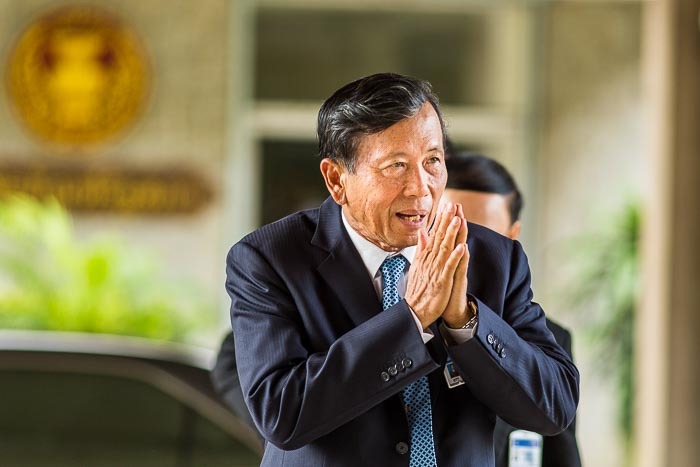 Surachai Liengboonlertchai, former speaker of the Senate (who hosted a meeting with Suthep during the protests in the days before the coup) was selected as first vice-president and Phirasak Porchit as second vice-president. The voting took less than five minutes. 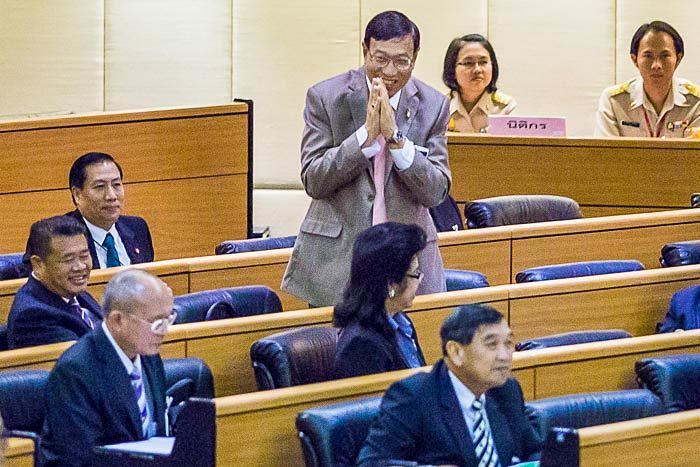 Pornphet Vichitcholchai thanks his fellow legislators for electing him President of the NLA. Photographically, it was a frustrating day for me. When I was working for newspapers in the US, my bread and butter was covering politics. Photographing the first day of the NLA was a bit of a throwback to those days. Back then I would have been covering the first day of the state legislature and I had access to the newspaper's inventory of long lenses. I would have been working with either a 300mm f2.8 or 400mm f2.8, Canon's ridiculously expensive (the 400mm f2.8 is about $12,000 US) L series telephotos. I don't need those lenses now, this was the first time since I've left the paper that I really needed anything longer than my 200mm f2.8. But when you need a 400mm lens, you need a 400mm lens. I ended up using my 200 and 1.4X teleconverter (for an effective focal length of about 280mm at f4). Using the teleconverter in the dimly lit Parliament was a challenge. With the 200mm lens I could get away with working at ISO3200. But with the teleconverter, which both takes one stop of light (my 200mm f2.8 becomes a 280mm f4) and requires a faster shutter speed (because the longer lens is more prone to camera shake) so I ended up working at ISO12,800. 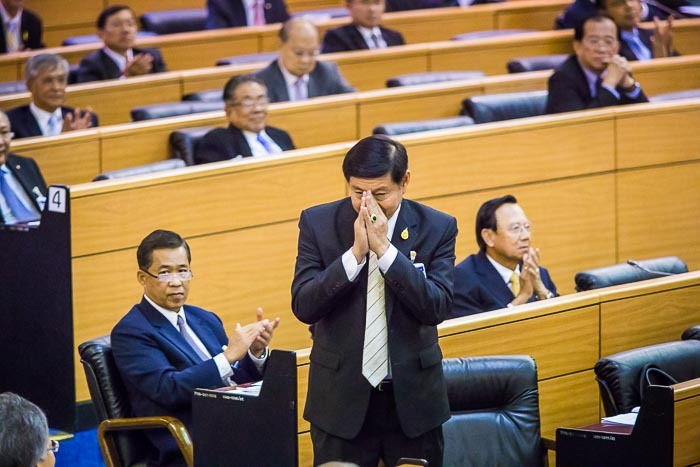 Peerasak Porchit thanks members of the NLA for electing him 2nd Vice President of the NLA. Made with my 200mm f2.8 & 1.4X teleconverter. Effectively a 280mm f4, ISO12,800, 1/250th at f4. This is the first time I've used ISO12,800 for anything serious. I was checking my work on the camera's back screen and I was not impressed with what I was getting. So when I thought it was over I left in a hurry. Big mistake. When it was over, the leadership stood in the middle of the chamber with their hands clenched over their heads in a victory pose. And I wasn't even in the room. It wasn't really a very good picture (none of the photos from the day were really very good photos) but it was THE photo. The one everyone used from the day. The only good thing to come out of the experience was the knowledge that I can work at ISO12,800 and still get usable images. I still remember the old days of film, when ISO800 (for color) was a big deal. Those low ISO habits are hard to break. There are more photos from the NLA opening in my archive.